(CNN) Nigeria is the seventh largest coffee producing country in the world, and two brothers there have decided to capitalize on this. After working abroad and soaking up caf culture, Ngozi and Chijioke Dozie opened Caf Neo in 2012 in Lagos, and now have 10 locations in Nigeria with plans to rapidly expand over the next few years across Africa. 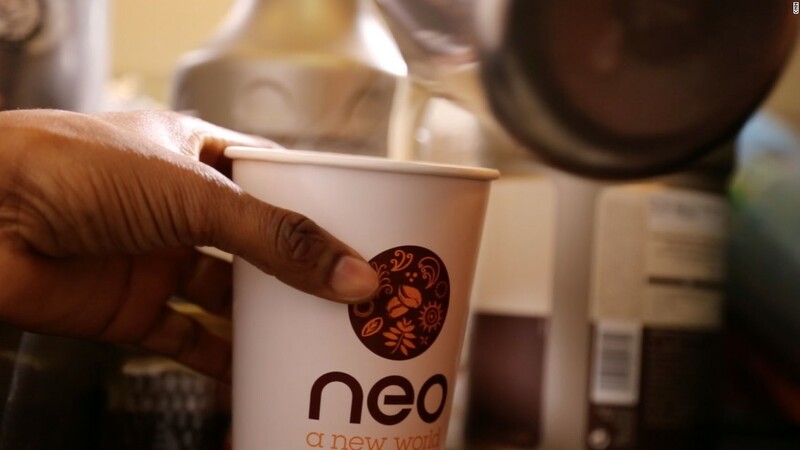 The duo have tapped into a $98 billion global industry, that has many fans in Nigeria but little choice of coffee shops, say the brothers. It took them four years to raise $400,000 and get their business off the ground. What's unique about Caf Neo? The brothers wanted their shop to be about more than just drinking coffee, they wanted to create a space for entrepreneurs and creatives to flourish. They do this by offering free Wi-Fi, jazz music that plays in the background and spaces for collaborative work. "Caf Neo is inspiring a lot of entrepreneurship and entrepreneurs in Nigeria, and hopefully, in other parts of Africa." says Ngozi. "We host hackathons, we host competitions. As we grow, there are more opportunities for people to come, work, collaborate, and the more opportunities for others to actually plug into Neo." The brothers are helping entrepreneurs across Africa who may not have a reliable power supply at home. "For most start ups, there isn't really any space for you," says Ngozi. "If you try and work from home, there's probably is no power, if you try to go to the hotel, it's not conducive." The brothers admit Nigeria is an emerging market that presents great opportunities for young entrepreneurs. "I can't think of a better place for an entrepreneur right now than in Nigeria," explains Ngozi. "There's definitely a coffee renaissance taking place in Africa, and we think that we are at the forefront." The pair make the most of social media and blogging to attract global attention; their #PersonalitiesAtNeo series highlights different characters you find in coffee shops across the world, and their blog draws potential customers in with posts such as Beginners guide on when to drink coffee. When the time is right, the brothers have global plans on their wish list. "One of our goals, is to have in London, in Soho, a Caf Neo store, and you have Nigerian roasted coffee, you have Tanzanian roasted coffee, you have Rwandan roasted coffee," says Chijioke. "The word 'neo' means 'gift' in Tswana, and also 'new' in Latin," explains Ngozi. The brothers admit they've beat well-known chains such as Starbucks to the Nigerian market, and they're hopeful that through their chain they'll have "the best African coffees produced by Africans, drunk in Africa", and possibly beyond Africa.